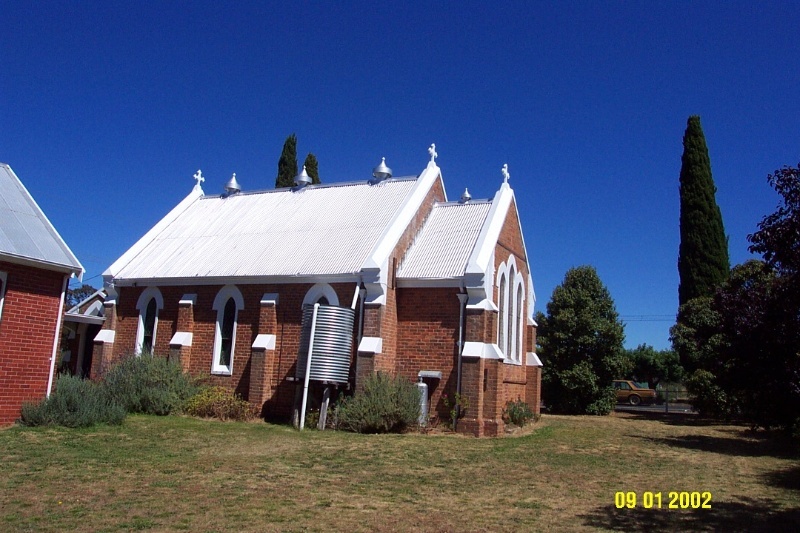 St. Mary's Anglican Church, located on the eastern corner of Bell and Stirling Streets in the township of Balmoral is a modest but fine example of the Victorian Gothic Revival style. The building is of simple design, constructed of locally made pressed red brick and render. The church has three bays with a chancel and porch, the buttresses dividing the bays. A large stained glass window dominates the interior of the church, depicting St. Peter, St. Andrew and Christ. The Armytage family from nearby Fulham Station donated this window, and Mrs. Armytage also laid the foundation stone of the church. Furniture, furnishings and memorials commemorate other local families. The relatively late date of construction indicates a stronger presence of Anglicans in the area at the time. 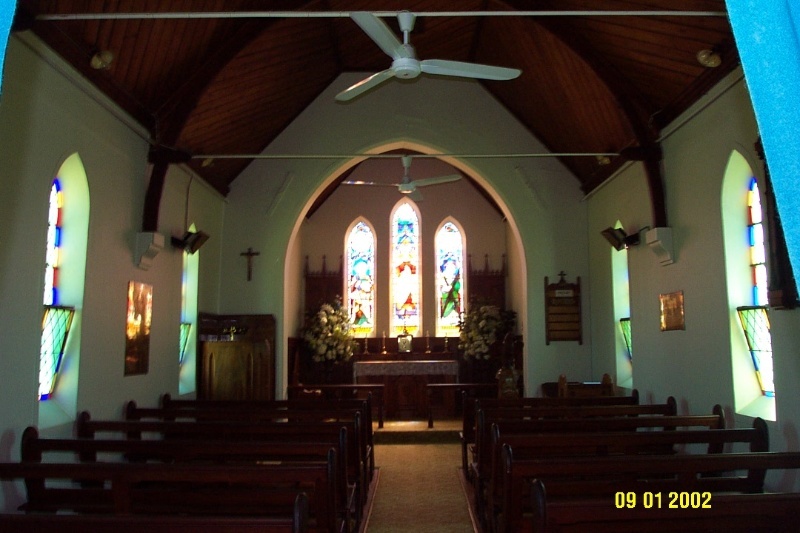 Until St. Mary's was constructed in 1894, Anglican services were held in the Presbyterian Church, serviced by ministers who were based at other towns, such as Sandford or Edenhope. In 1895, a parsonage was built at Harrow, which was used by ministers serving Balmoral until 1948. With the extension of the parish to include Toolondo and Cavendish, it was decided that Balmoral would be more central. For some years a house in Bell Street, near Mather's Creek, was used as a vicarage until the present vicarage was completed in 1968. This has since been closed and the parish is served from Coleraine. A sympathetically constructed Sunday school is located on the south east side of the church. The church is approached through ornate gateposts, although the original fence has been replaced by wire mesh. Two mature Cupressus sempervirens (Pencil pine or Italian Cypress) specimens stand adjacent to the gate and are identified by a small brass plaque which states they were planted to commemorate Queen Victoria's Diamond Jubilee in 1897. A third pine is located at the north west corner, the three being the survivors of a row marking the Stirling Street boundary of the church. There are also conventional ornamentals. Near the porch stands an ornate cast iron street lamp, now electrified, which was one of four kerosene street lamps which lit nineteenth century Balmoral. The church building, its interiors and grounds retain a very high degree of integrity and are in excellent condition. 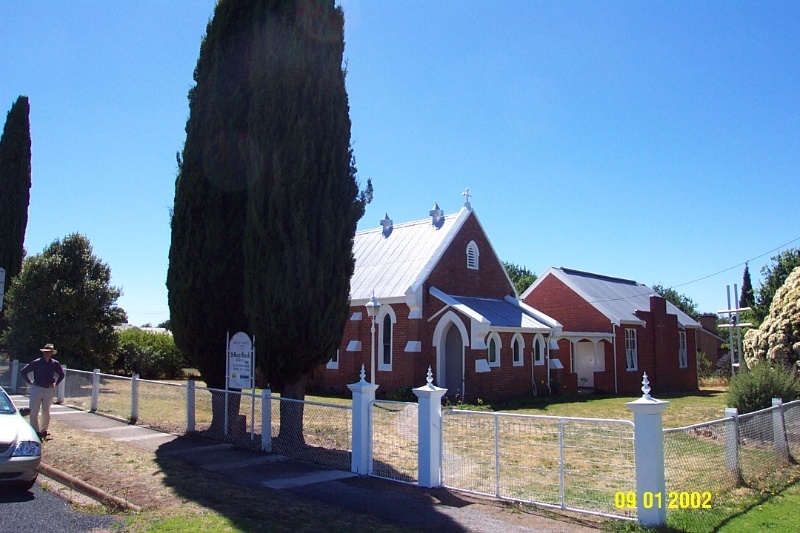 St. Mary's Anglican Church is of social, architectural and historical significance to the township of Balmoral and the Southern Grampians Shire. St. Mary's Anglican Church is of architectural significance as an example of the Gothic revival style in its application to places of worship and for expressing particular religious values. This is demonstrated by the range and quality of its interiors, including the altar, the main window, lectern, and several memorials and plaques. It is also a useful comparison with the churches of other denominations in Balmoral. 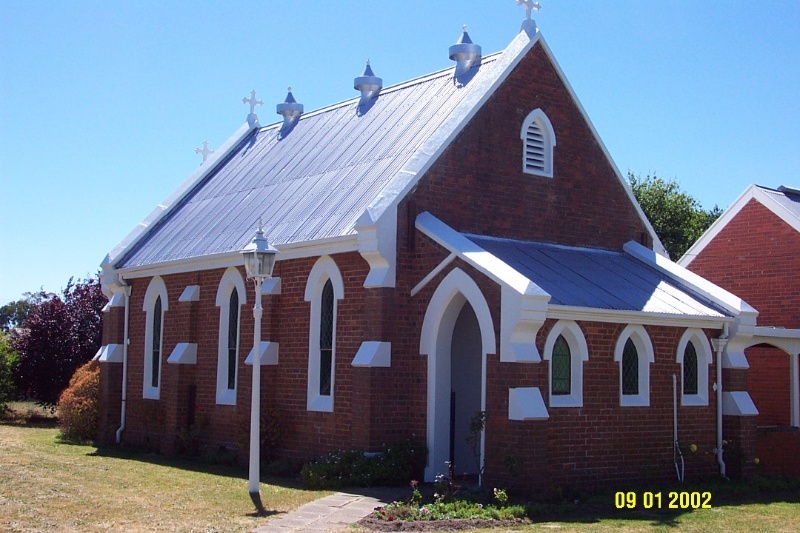 St. Mary's Church is of historical significance as the last substantial church to be built in the Balmoral district illustrating the growth of the Anglican faith in the township towards the turn of the century and its consolidation immediately afterwards. The donation of land, materials and furnishings represents the affluence and generosity of the many important early settlers who belonged to the congregation, including the Armytage family from Fulham and the various owners of Kongbool. The grounds are historically significant for the commemorative planting of Cupressus semprevirens (Pencil pine or Italian Cypress) and the complex as a whole is historically significant as the expression of the role and position of the Anglican Church and its congregation in the community for over one hundred years. The exterior and the interior of the church are in excellent condition, the grounds are also in very good condition. Built of locally pressed red bricks and render, St Mary's is a simple design in the Gothic revival style, of three bays with a narthex or porch and a chancel. Buttresses divide the bays, and a simple foundation stone stating "St Mary's AD 1894" is placed in the footings of the buttress nearest the porch. The main roof of corrugated iron, painted silver, is pitched at 60º, as is the chancel roof but that of the porch is a skillion roof. Both the doors of the porch have paired ledge and braced leaves with substantial ironmongery. The porch has three small lancet windows, similar to the side windows. Three patent metal ventilators straddle the ridge line with a smaller on the ridge line of the chancel. Arches, window reveals and sill, coping stones and other details, such as the finial crosses on the gables are render painted white. The interior and its fittings and furnishings are also typical of the style. The walls are plain plaster, the ceiling has simple exposed trusses and timber lining boards. The chancel is divided from the nave by a low communion rail. Its window, which dominates the interior, is composed of three lancets with stained glass, depicting St Peter, Christ and St Andrew. The side windows are leadlight in a diaper pattern with multi-coloured borders. The sanctuary contains a finely carved lectern in the form of an eagle, dedicated to the memory of General Sir Neville Smyth, VC, KCB. A large brass plaque on the west wall is also dedicated to Sir Neville Smyth, who lived at Kongbool Station. Other plaques on the walls include dedications to Charles Henry Armytage, owner of Fulham Station, who died 26 April 1876, Private Charles Vincent, a First World War casualty, and William Reginald Hayman: ". Chief promoter of this Church, for over 40 years a resident of this neighbourhood, thrice Shire President, founder of the local P and A Society and Show, and in innumerable ways an enlightened and energetic friend of the district." In the porch a framed silver trowel commemorates the start of construction of St Mary's, with the laying of the foundation stone by Mrs. R H Armytage in September 1894. There is a Sunday School linked to and immediately south-east of the church. Built in the 1960s, it follows the materials, form and detailing of the church closely. The grounds of St Mary's contains several items of heritage interest. The church is approached through ornate gate posts, although the original fence has been replaced by wire mesh. Two mature Cupressus sempervirens stricta specimens stand adjacent to the gate and are identified by a small brass plaque which states' "These pencil pines were planted in 1897 to commemorate Queen Victoria's Diamond Jubilee" A third pine is located at the north west corner, the three being the survivors of a row marking the Stirling Street boundary of the church. There are also conventional ornamentals. Near the porch stands an ornate cast iron street lamp, now electrified, which was one of four kerosene street lamps which lit nineteenth century Balmoral. Excellent degree of integrity externally and internally.